David Myers stands at the new Coffee Bar, one of many futuristic renovations in the Cabot Library. Seamlessly blending diner-style study booths, flat-screen TVs, multiple social collaboration spaces, and a new “Discovery Bar” with the traditional stacks of books familiar in any library setting, the renewed Cabot Science Library opens today with a range of welcoming amenities and resources for the Harvard community. The unveiling marks the culmination of more than two years of planning and construction at the Science Center atrium and Cabot Science Library with the goal of better supporting learning and teaching for the digital age while effortlessly connecting the library to the atrium and plaza social spaces. Built in 1973 and designed by Josep Lluís Sert, then dean of the Harvard Graduate School of Design (GSD), the Godfrey Lowell Cabot Science Library serves as Harvard’s general science library, supporting learning and research in STEM subjects through a variety of services, including a team of science and engineering librarians, technological tools, and access to research collections in engineering, mathematics, physics, statistics, Earth and planetary sciences, psychology, and cross-disciplinary studies. Aligned with the goals of Harvard’s Common Spaces initiative, the library combines traditional library features — books, computers, and quiet common areas — “with flexible spaces and creative services to transform the way in which the library meets the evolving needs of science and engineering research and education,” said Thomas. Part of the goal of the renovation was to reinvigorate the Cabot Science Library as a place that serves the present and future needs of both the disciplines housed in the library, as well as the needs of the campus at large. Enhancements were made to link the library with the whole of the entry area and ground floor of the building to create a deep sense of connection between the social aspect of the Science Center and the study and research offerings of the library. 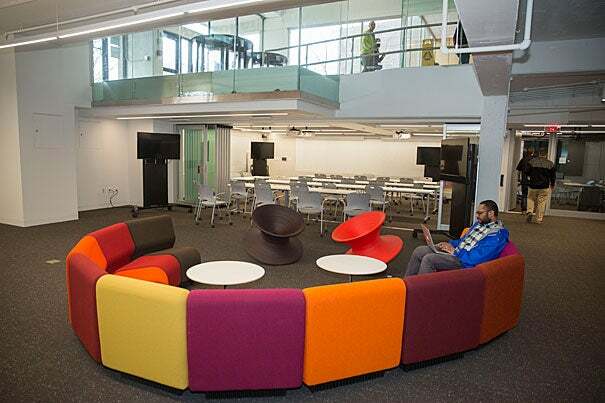 “The College hopes this new space can foster student-led programming such as social events, support creative collaborations with library staff, and serve as an environment in which students can connect informally with their peers, faculty, and staff,” said David Friedrich, associate dean of students at Harvard College. Designed by Mack Scogin, Kajima Professor in Practice of Architecture and former chairman of the Harvard Department of Architecture, and his partner, Merrill Elam, many of the walls and surfaces are white or glass. Added pops of color in the furnishings throughout lend the streamlined space a liveliness that gives students and scholars a vibrant setting for study and play. At the main entrance to Cabot, users will find that renovations have made the library a visibly vital part of the building. Once inside, glass walls surround, offering a glimpse into the library. A ramp sets off a large projection screen, which has the ability to showcase scientific scholarship and library resources. It also displays a social space, with the café bridging the main corridor and the space of the library. Cabot’s first floor is open, colorful, and high-tech — a space that has the feel of an upscale café designed for conversation and collaboration. The main passageway of the building is now well-lit and spacious, and users can see through the building into the central courtyard. An exciting feature of the library is the Discovery Bar, which anchors a flexible presentation and exploration space that will host a variety of programs. 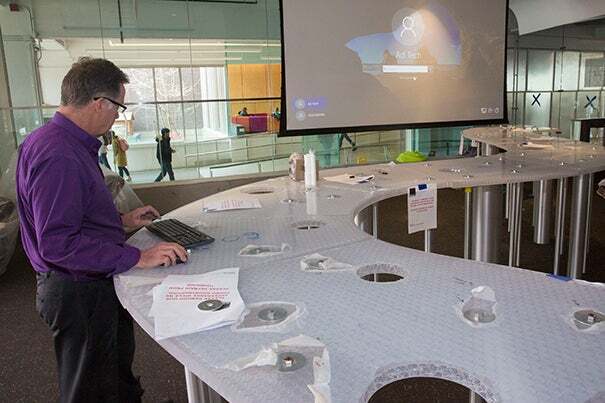 Here, students can participate in demonstrations at the bar, or take part in larger programming that utilizes the open space nearby. 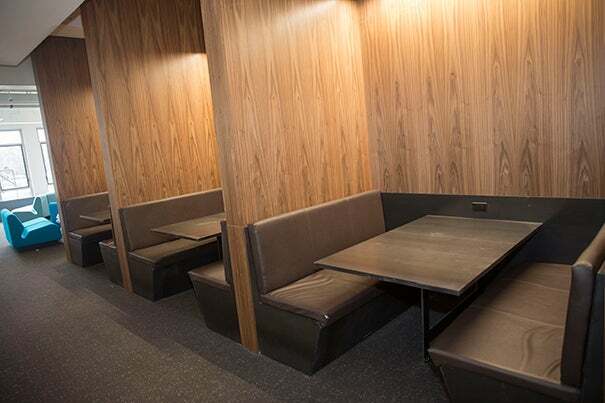 Harvard community members can grab a bite to eat and coffee at Clover Food Lab, and can choose to settle in at one of the numerous tables or comfy chairs in the nearby café space or to enjoy the newly designed courtyard, which extends study and social spaces to the outside. Students will find myriad environments for academic or social time, supported by integrated learning resources and a dedicated research staff. Cabot Library’s lower level is equally bright thanks to the building’s open floor plan, and supports new media, group study, course reserves, and collections. 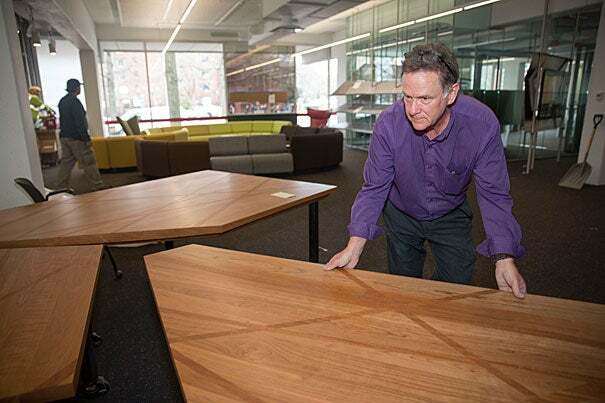 This floor features some of the library’s most advanced technology, including two new media studios where users can create and edit their own videos and multimedia, and a new flexible instruction room next door. Building on the success of Lamont B30, Harvard Hall 202, and other active-learning classrooms, the instruction room includes multiple projectors, video cameras, and an overhead camera. Instructors have the ability to present from laptops and cellphones, and students can project work from their individual tables to several video-carts. With a capacity of 24, the room’s glass wall can easily be pulled aside to open into an overflow area. The lower level also offers seven group study rooms, featuring large monitors and writable walls. Users on this floor can facilitate video conferencing or interviews in three personal chat booths. For the first time, undergraduate students will be able to reserve study rooms on their own, using Roombook — a reservation system used on campus. Faculty, graduate students, and staff are welcome to use the spaces, though library staff will mediate their requests. Jeffrey Schnapp, faculty director of the metaLAB at Harvard and chair of the faculty committee that directed the renovations, shared a unique perspective on the opportunities this renovation provided members of the Harvard community. 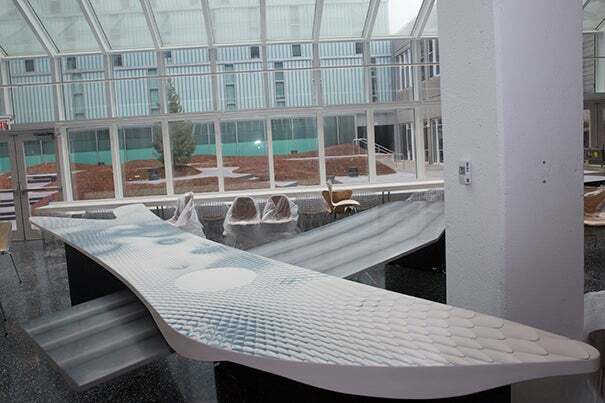 This transformation of the Science Center atrium and Cabot Science Library was made possible by a generous gift from Bryan Traubert and Penny Pritzker ’81, as part of the Campaign for Arts and Sciences. “We are very proud to honor my parents at their beloved alma mater by making a significant improvement to the quality of the student experience,” said Pritzker.